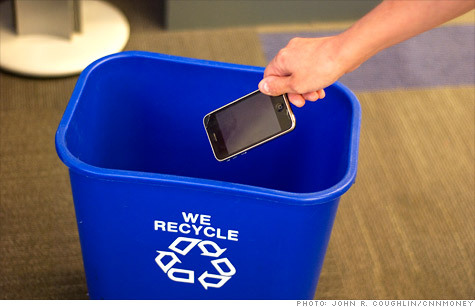 When you recycle cell phones, like the iPhone, at trade-in companies -- it's probably going to be resold, but it could also be broken down for its copper and gold. NEW YORK (CNNMoney) -- If you're one of the more than 1 million Apple enthusiasts who pre-ordered an iPhone 4S this week, you're likely looking to ditch your old phone. The day that Apple (AAPL, Fortune 500) unveils a new iPhone is like the Black Friday of cell phone trade-in services. Gazelle, one of the best known of the so-called "recommerce" sites for electronics, said that it received a phone every six seconds during Apple CEO Tim Cook's presentation on Oct. 4. As sales of expensive smartphones grow rapidly, trade-in sites have also risen in popularity. Their services give customers the opportunity to make some cash off their old devices, which shoppers can use toward their shiny new handsets. At one point last week, Gazelle had offered up to $284 for some iPhone 4 trade-ins. But what happens to your trade-in once you ship it to Gazelle, ReCellular, NextWorth, Amazon (AMZN, Fortune 500) Trade-In, or any of the other recommerce sites out there? First, cell phones are inspected for wear and tear and to see whether they still work. Damaged phones are assessed for salvageability. All phones then go through a memory wipe. Each trade-in company said it wipes memory in two steps to ensure your data is completely erased from the phone. If the phone doesn't work, the companies will physically destroy its memory. "We make sure there are no late-night texts still on your phone," said Joe McKeown, vice president of marketing at ReCellular. Phones that are in excellent shape are typically either sold directly to consumers on the trade-in companies' sites, or they're hawked on eBay (EBAY, Fortune 500) or Amazon. Gazelle receives so many iPhones that it tends to sell Apple's smartphones to wholesalers, since the recommerce company lacks the manpower to sell all of them on eBay or Amazon. But it's in the traded-in junk where it starts to get interesting. 0:00 / 3:13 Can the iPhone 4S win over consumers? Old phones that are in workable condition and still have some demand for them (think Motorola RAZR, LG enV) are sent to wholesale partners. Those wholesalers have access to retail chains in and out of the United States that specialize in selling used feature phones to customers. "You'd be surprised, but these wholesalers find demand for those items around the world -- usually in developing countries where there's not a lot of supply for those products," said Israel Ganot, CEO of Gazelle. New but broken phones are typically sold to wholesalers that recondition the devices and sell them back to carriers or retailers for warranty replacement handsets. Gazelle said about 90% of its devices are resold. ReCellular said roughly 80% of smartphones and 60% of feature phones are ultimately sold back to consumers. "Typically there is some value in a device, but if it's so old or broken, it needs to be recycled," said Jeff Trachsel, spokesman for NextWorth. "We'll get those old bag phones or brick phones that are about a foot long," said ReCellular's McKeown. "Every day you get something like that." Gazelle said it has a small museum in its headquarters of surprising things people sent in, including a Motorola (MMI) DynaTAC 1980s-era "brick" phone, a Motorola StarTAC phone, a pager, a first-generation iPod, and an original Nintendo. But "ancient" and broken technology actually has a lot of value -- to trade-in sites, if not to you. Most won't pay more than a few cents for these old phones, but they'll happily recycle them if you send them in. There are 0.034 grams of gold in each cell phone, according to the U.S. Geological Survey. That's the equivalent of 0.001 troy ounces, worth about $1.82 at today's prices. There are also 16 grams of copper, worth about 12 cents, 0.35 grams of silver, worth 36 cents, and 0.00034 grams of platinum, valued at 2 cents. In bulk, that's a ton of precious metal. In fact, ReCellular said it recycled enough gold last year to make 1,500 wedding bands and enough copper to make two Statues of Liberty. The trade-in companies all send parts to one of just two smelters in the United States, so that tiny amount of value becomes a treasure trove of bling. "They're doing this in very, very high volume," said Ken Byer, CEO of Cloud Blue, Gazelle's recycling partner of choice. "There's more gold in a pound of electronics than a pound of gold ore, so it's certainly worth it." So when you send in your old phone to get some cash, it could eventually become someone's wedding ring.